Atlantis, The Palm resort is a spectacular luxury property strategically located on the manmade island of Palm Jumeirah. 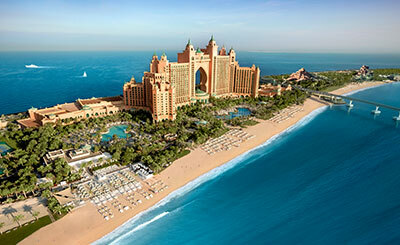 The Emirates Mall is 15 minutes drive and the Dubai City Center is 25 minutes drive from the resort. 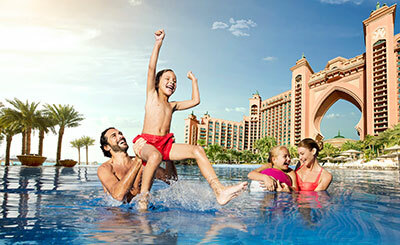 This resort enables guests to visit major attractions including the 42 acre water themed amusement parks known as Aquaventure and the Lost Chambers. 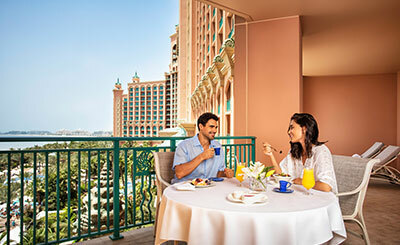 Atlantis, The Palm resort is approximately 35 kilometres from Dubai International Airport, which means you won’t have to spend too much time travelling. Please Note: Shark Safari & Ray feeding activities will be temporarily closed until further notice. Ossiano: Dine underwater against a breathtaking backdrop of 65,000 marine animals at Ossiano while you experience award-winning fine dining from Chef Gregoire Berger. 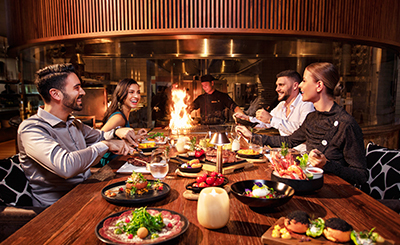 Nobu: Chef Nobu Matsuhisa is renowned for modern, inventive cuisine that blends traditional Japanese dishes with South American ingredients. This sleek modern restaurant is infused with Japanese style. Hakkasan: With multiple Michelin stars in locations throughout the world, Hakkasan offers guests a unique and enticing dining experience. Ronda Locatelli: Celebrity Chef Giorgio Locatelli presents family-style Italian cuisine from brick-oven pizzas as well as antipasti and delicate pasta. Platos: The celestial surroundings of Platos offers a delightful place to while away an hour or two at any time of day or night. A traditional Arabian coffee house. Kaleidoscope: This family-friendly restaurant invites guests to enjoy their favourite international dishes - including a range of specialities from India, Italy and the Middle East. Saffron: Take a journey throughout Asia, meeting the wonders of twenty theatrical cooking stations along the way. Saffron also offers a unique Friday Brunch with Asian specialities. The Edge: Located alongside the Royal Beach and adjacent to the Royal Pool, The Edge offers delicate pizzas from the wood-fired oven, salads, burgers and grills. The Shore: Serving delicious Mexican cuisine and located right next to the Royal Beach and Royal Pool, The Shore is the perfect place to spend a lazy day. Shark Bites: With indoor and outdoor seating at Aquaventure Waterpark, Shark Bites is ideal for families. The menu features all the classics, such as burgers, salads, pizzas. Asia Republic: Asia Republic draws inspiration from the cuisines of the Far East, set in a vibrant focused on fun sharing; Asia Republics diverse menu tantalizes the taste buds of all. Seafire Steakhouse: This award-winning steakhouse boasts exceptional cuts of meat. The extensive menu features Wagyu, Black Angus and our very own Atlantis Certified Cattle, all prepared to order. illy Cafe: Located in Poseidons Court overlooking the magnificent Ambassador Lagoon, treat yourself to freshly brewed illy coffee from our trained baristas and some of our pastries, cakes and more. 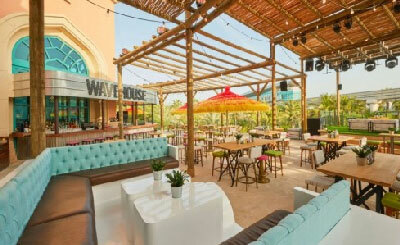 Nasimi Beach: Soak up the sunshine with bites and cocktails at Dubai hottest beachside venue. Nasimi Beach offers a selection of sushi, salads and grills. Barracudas: This waterpark eatery offers choices from all corners of the world. Burgers form TBJ, golden-fried chicken from Rooster 66, pizza from Peetza, shawarma and falafel from Shawafel. The Burger Joint: TBJ (The Burger Joint) is a casual family restaurant perfect for those who love craft burgers. Pair your mouth-watering burgers with classic American-style homemade fries. Shawafel: Two Middle Eastern favourites at one eclectic eatery! Try the signature chicken or lamb Shawarma sided with some classic falafels and Shawafel cheese fries. Ayamna: Ayamna is a destination that invites you to revive precious memories over authentic Lebanese delicacies by Chef Ali Elbourji, served within contemporary luxurious settings. Seafire Steakhouse & Bar: The walk-in wine cellar houses a collection of over 3,500 bottles and adds an extra dimension to the dining experience. Bread Street Kitchen & Bar: Mirroring the lively warehouse style of Celebrity Chef Gordon Ramsays famous Bread Street Kitchen in London, this gastropub serves up British classics with a twist. Barazura Cocktail Bar: With its cool blue hues and striking metallics, Barazura sets a sleek and charming ambience to enjoy the best cocktails, mocktails, wines and champagnes. Let the tranquility of the Arabian Sea elevate your stay. 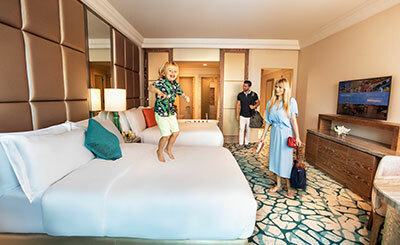 Our Ocean King Rooms come with partial or full views of the Arabian Sea, a spacious king-sized bed, as well as elegant bathrooms with a walk-in shower and separate bath. 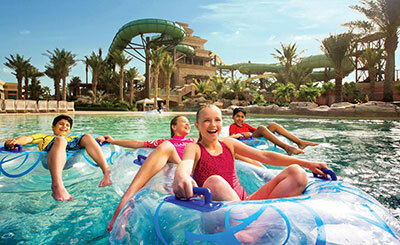 Unlimited complimentary access to Aquaventure Waterpark and The Lost Chambers Aquarium. Soak-in the views of the deep blue waters of the Arabian Sea. Our Ocean Queen Rooms come with partial or full views of the Arabian Sea, two queen-sized beds, as well as elegant bathrooms with a walk-in shower and separate bath. 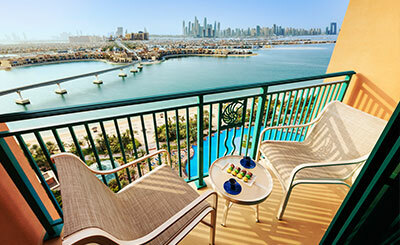 Stunning views of the Palm Island make for an iconic Dubai experience. Our Palm King Rooms come with partial or full views of Palm Island, a spacious king-sized bed, as well as elegant bathrooms with a walk-in shower and separate bath. Breathtaking by day and dazzling by night, make the most of our exclusive vantage point on Palm Island. Our Palm Queen Rooms come with partial or full views of Palm Island, two queen-sized beds, as well as elegant bathrooms with a walk-in shower and separate bath. Our Imperial Club King Rooms come with a spacious king bed and partial or full views of the tranquil Arabian Sea or the iconic Palm Island. As an imperial Club guest, you are entitled to a host of exclusive Imperial Club benefits across the resort. Our Imperial Club Queen Rooms come with two queen-sized beds and partial or full views of the tranquil Arabian Sea or the iconic Palm Island. As an imperial Club guest, you are entitled to a whole host of exclusive Imperial Club benefits across the resort. Enjoy spacious and luxurious living with generous sized rooms of 94 square meters and boasting the largest balcony of our suites range. Experience scenic panoramas of the Arabian Sea or The Palm Island while you sunbathe or dine in complete privacy on the fully-furnished terrace complete with sun lounges and dining set. Relax, unwind and feel right at home in this beautifully furnished suite of 101 square meters, featuring an expansive living and dining area. Take a quiet moment out on the balcony to take in the breathtaking views that can only be experienced from the viewpoint of Atlantis. Spanning 164 square meters, this lavish suite features plush, spacious living areas, a large balcony with sweeping views and a magnificent master bedroom with its own majilis. The grand en-suite is sure to take your breath away, featuring a free standing oval jacuzzi and chaise lounge creating a space for absolute relaxation and indulgence. Beautifully appointed with an abundance of space, you and your little ones can relax in comfort after a long day of fun and adventure. Accommodating up to 6 guests, each suite offers a large Master Bedroom, separate twin bedroom, and two spacious bathrooms, featuring a large oval bath in the master en-suite. If you are looking for the most intimate and romantic setting for your holiday, look no further. 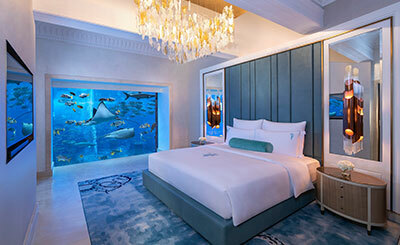 Our three story aquatic-themed Underwater Suites offer floor-to-ceiling views of the Ambassador Lagoon and its 65,000 marine inhabitants.